I am sooooo excited that I have finished my Tim Tag for March! When I saw that he was using paints-I was super happy because I haven't used my paints in forever. I know-something I shouldn't even say out loud, but it is true. Of course until now! I don't have Tim's beautiful butterfly but I did have this Graphic 45/Hampton hot air balloon stamp. And I thought I was using the right letter stencil but his is different. My stencil is still a Tim H. but it's different. But the enamel gold effect still happened--and is very cool! There's tape under the paint too-Tim tape but different than what he used. Gorgeous!!! 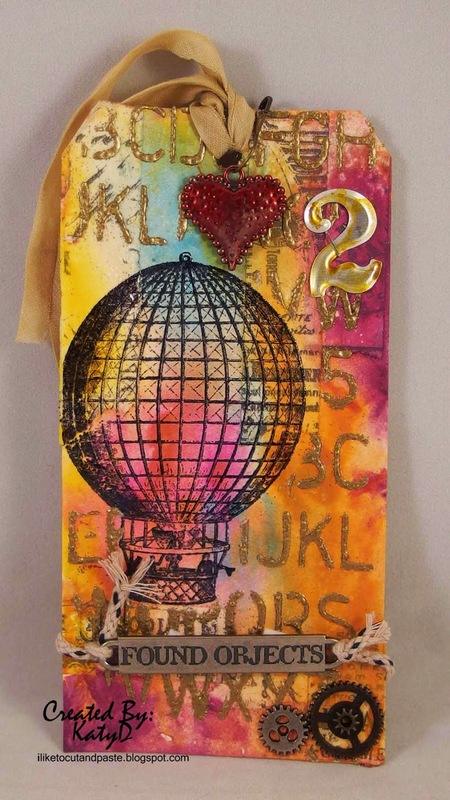 LOVE that hot air balloon stamp and the amazing background! !